Momma on a Mission: Why am I still nursing my toddler? Why am I still nursing my toddler? Little T will be 14 months at the end of this month. He's walking, "talking", climbing couches, and digging in the dirt. He's also still nursing. Oh, and not just once or twice a day. Six or seven times a day, and a couple of times at night too(we mostly co-sleep). Want to know why? Is there anything more natural than a child nursing? No preservatives, no fakes, no add-ons, nothing artificial. Just a mom, a baby, and pure milk. It's how babies have been fed for thousands of years. Throw us both on a deserted island with just a beach and a palm tree and we'll still be nursing. Ok, ok, I know what you're thinking. Nursing for longer than a year isn't normal! And you're right- in the US, it's not. After all, only 22% of American babies nurse until their first birthday, and there aren't even any statistics gathered about children who continue to be nursed after that! But the idea that a baby shouldn't nurse past their first birthday is unique to the American culture, and unique to this time period. In many, many other parts of the world, children are nursed into the second and third year of their lives. And all throughout history until around 50-100 years ago, children have nursed for much longer than 12 months. In Biblical times, the age of weaning was somewhere between 2.5 and 4 years. Except for in a few modern locations and cultures, breastfeeding past 12 months is and has been very normal! Because the WHO recommends it. The WHO recommends that children be nursed for two years or longer. Breast milk. Breast MILK. It's just milk. It's just food. It's not sexual, it's not gross, it's not inappropriate, it's not abusive. Would we put any of those labels on any other type of food? Ever heard anyone say that they should stop feeding their child apples when they reach a certain age, because it's just inappropriate? Ever heard someone say that it's abusive to feed chicken to your 2-year old? That just sounds silly! We need to put aside our cultural hangups and start looking at breast milk for what it is- food. I have to feed my child something. Even now that he's eating solids, I'll want to give him some type of milk. And if I'm not still nursing him, I'll have a pretty big decision to make. Should I give him whole cow's milk, raw cow's milk, toddler formula, almond milk, soy milk, goats milk, or coconut milk? Some of these are decent choices, and some of them are not. But none of these options have been formulated exclusively for a human baby, and specifically for MY baby. (Did you know that the composition of breast milk changes to meet the baby's specific needs as he ages?) By continuing to breastfeed, I make things so much easier! I know I'm still feeding him the absolute best thing in the world for him, and the only food that's been made just for him. Because it's not just food. But nursing is so much more than just food. It's such a source of comfort for a toddler. One and two year olds are growing and developing so quickly, and that can be stressful at times! They're learning about the world, about themselves and the things that they can do. It's so important for them to know that they can always come back "home", to a safe place where they are loved and secure. Nursing has been my child's safe, happy place since the day he was born- I don't want to take that away from him until he's ready. I love knowing that if he gets hurt, or scared, or tired, I have a quick fix! Nothing calms an upset toddler quicker than the breast. And nothing makes me feel closer with my child than nursing him. Of course, moms that aren't nursing are still a source of comfort and safety for their children. Of course! But from my experience, nursing just makes that quicker and easier to accomplish. Because it's good for him. The benefits of breastfeeding don't go away just because my child has reached his first birthday. Breast milk continues to provide amazing immunological benefits, keeping him from getting sick as often. Breast milk reduces my child's risk of digestive disease, heart disease, diabetes, obesity, ear infections, and many more. Those benefits don't go away after the first year. And did you know that scientists have now discovered that a substance in breast milk kills cancer cells? I want my kid getting as much of that stuff as possible! Because it's good for me. Breastfeeding reduces my risk of breast, ovarian, uterine, and endometrial cancer. And the longer I nurse, the more my risk is reduced. Breastfeeding also keeps my cycle from returning- I'm not going to complain about that! Because I don't have a good reason to stop. First birthday? It's just a day. I don't stop giving my child anything else that's good for him just because he's reached a certain age. Teeth? Nah- he doesn't bite me. Nearly all toddlers can be taught not to bite while nursing. Have you ever wondered why they're called milk teeth? It's because we're meant to be nursing while we have them. Some people have even hypothesized that the physiological age of nursing isn't until a child starts losing their milk teeth! How's that for "weird"?! Because he's eating solids? Nope- he still gets more nutritional bang for his buck from breastmilk than he does from solids. 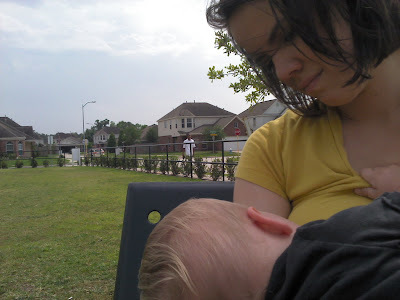 Here we are nursing at the park, at 13.5 months. love it! so well said! Love love love this post and I couldn't agree more! My baby girl just turned one year. We are still breastfeeding 3x per day, with no signs of stopping. She still looks for her milk. I can relate to each of the points you shared here. My only "obstacle" is the relatives who tolerated breastfeeding up to this point, but are starting to think it's very, very weird to be breastfeeding my one year old... Oh well! Great post! Keep on breastfeeding! Who cares what they think? Eventually the more we do it, the more it will become normal in our society. 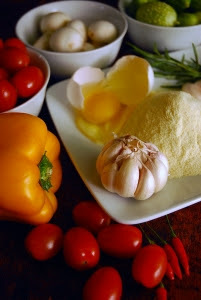 Azure Standard- Affordable Healthy Food! The Breastfeeding Doll: Promoting Promiscuity?